Secretary of the Nobel Committee for Physiology or Medicine, Thomas Perlmann (R) announces the winners of the 2018 Nobel Prize in Physiology or Medicine during a press conference at the Karolinska Institute in Stockholm, Sweden, on October 1, 2018. 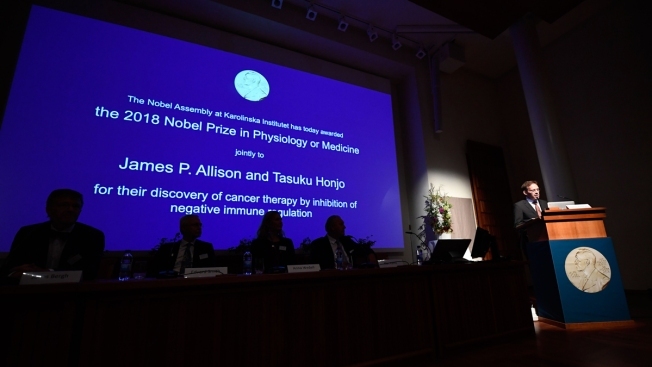 The Nobel Prize in medicine was awarded Monday to two researchers from the United States and Japan for advances in discovering how the body's immune system can fight off the scourge of cancer. The 9-million-kronor ($1.01 million) prize will be shared by James Allison of the University of Texas Austin and Tasuku Honjo of Kyoto University. Their parallel work concerned proteins that act as brakes on the body's immune system and it constitutes "a landmark in our fight against cancer," said a statement from the Nobel Assembly of Sweden's Karolinska Institute, which selects winners of the annual prestigious award. "I'm honored and humbled to receive this prestigious recognition," Allison said in a statement released by the university's MD Anderson Cancer Center in Houston, where he is a professor. "A driving motivation for scientists is simply to push the frontiers of knowledge. I didn't set out to study cancer, but to understand the biology of T cells, these incredible cells that travel our bodies and work to protect us," he said. The physics prize is to be announced Tuesday, followed by chemistry. The winner of the Nobel Peace Prize will be named Friday and the economics laureate will be announced next Monday. No literature prize is being given this year.